In an interview with filmmaker Michael Galinsky and Atlantic Yards opponent Daniel Goldstein on ABC-TV, Up Close with Diana Williams, we learn Forest City Ratner's response to the film Battle for Brooklyn. 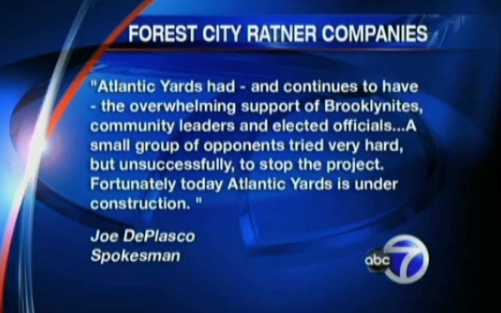 "Atlantic Yards had--and continues to have--the overwhelming support of Brooklynites, community leaders and elected officials," says the statement, attributed to paid spokesman Joe DePlasco. "A small group of opponents tried very hard, but unsuccessfully, to stop the project. Fortunately today Atlantic Yards is under construction." Overwhelming support? Actually, initial polls showed opposition to the project if it involved eminent domain or involved public costs. Both, of course, are part of the project, but later polls indicated support for the project when it was said to "provide" subsidized housing. It won't. City subsidies would provide it. Williams commented at the end of the FCR statement, "And you make the argument: not really." "There's an arena," responded Goldstein. "The rest of the site is demolished and all we're being promised is parking lots." Not quite--Forest City Ratner is now talking about finally launching the long-delayed first residential building. But the project is way behind the promises. Galinsky explains a justification for the film: to change the narrative, as propounded by New York Mayor Mike Bloomberg at the March 2010 groundbreaking, "No one's going to remember how long it took, they're only going to see that it was done." Williams, playing provacateur, suggests that Goldstein, as the film's protagonist, isn't a hero, since heroes accomplish things, "but nothing's changed... state courts ruled against you." "I would argue that plenty changed," Goldstein responded. "The project was heralded as this great thing, this done deal.. if you talk to people about Atlantic Yards now, it's a disaster." Galinsky said that Goldstein stood by his principles and also found a new life, with a wife and child. But Golstein didn't go down with his apartment but negotiated a deal, Williams observed. "New York State seized my apartment," Goldstein said. "They gave you money... several million dollars," she added. "They compensated me for two things, taking my apartment, and kicking me out against my will... they made me whole," Goldstein said. Forest City Ratner got far more in public largesse than it transferred to Goldstein, and Goldstein, after the costs of moving, taxes, an attorney, and a new apartment, didn't take home nearly as much as people think. Williams asked if Galinsky feels "like you've created any change in the way people see eminent domain." Galinsky pointed out that the film has just emerged, so has yet to have had a big influence. He said that "all the politicians who represented the area, they were all against it," which isn't quite true, given that Assemblyman Roger Green was a supporter, his successor Hakeem Jeffries rode the fence, and Rep. Yvette Clarke, in contrast with her predecessor Major Owens, supports the project. He added that there were "only two politicians from Brooklyn at the groundbreaking." That was an exaggeration--but it was notable that so few attended, and none from the immediate area. Galinsky noted that "New York has one of the worst records on eminent domain" and that, after the Supreme Court's controversial 2005 Kelo decision, 43 states changed their laws, but New York has not. I'd add that even mainstream law professors believe that New York law, as evidenced in the Atlantic Yards and Columbia cases, needs reform. "Do you ever feel like the community had any say?" Williams asked. Goldstein responded that no local elected official, city or state, got to vote, and that, had the project gone through the city's Uniform Land Use Review Procedure, it would have been changed, and been seen as more legitimate. Williams asked what her interviewees want people to think after seeing the movie. Galinsky suggested a more careful reading of the press. Goldstein said he hopes people "realize that the project is not what it may have seemed" and that people are inspired to try to fight back. In an excerpt from an interview on NY 1, former Daily News columnist--and longtime AY booster--Errol Louis is somewhat lower key when talking to the filmmakers. He makes the not unreasonable point that eminent domain is legal, and that those losing their property should get just compensation. Galinsky responds that most states other than New York have reformed their laws; again, he'd have an even stronger case if citing scholars who believe New York is a real outlier. Galinsky also challenges Louis--who has a cameo in the movie jousting with Council Member Letitia James at a press conference--for claiming that some who sold to Ratner were made instant millionaires. "Although obviously you had a point of view, I thought you were pretty fair about trying to get everybody somewhere into the frame of it," Louis said to the filmmakers.